Garrison (various spellings) (from the French garnison, itself from the verb garnir, "to equip") is the collective term for a body of troops stationed in a particular location, originally to guard it, but now often simply using it as a home base. The garrison is usually in a city, town, fort, castle or similar. "Garrison town" is a common expression for any town that has a military base nearby. 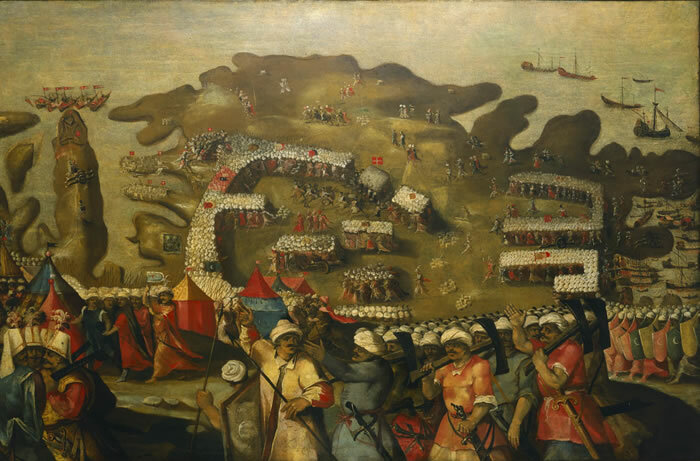 "Garrison towns" (Arabic language: حصون‎) were used during the Arab Islamic conquests of Middle Eastern lands by Arab-Muslim armies to increase their dominance over indigenous populations. In order to occupy non-Arab, non-Islamic areas, nomadic Arab tribesmen were taken from the desert by the ruling Arab elite, conscripted into Islamic armies, and settled into garrison towns as well as given a share in the spoils of war. The primary utility of the Arab-Islamic garrisons was to control the indigenous non-Arab peoples of these conquered and occupied territories, and to serve as garrison bases to launch further Islamic military campaigns into yet-undominated lands. A secondary aspect of the Arab-Islamic garrisons was the uprooting of the aforementioned nomadic Arab tribesmen from their original home regions in the Arabian Peninsula in order to proactively avert these tribal peoples, and particularly their young men, from revolting against the Islamic state established in their midst. In the United Kingdom, "Garrison" also specifically refers to any of the major military stations such as Aldershot, Catterick, Colchester, Tidworth, Bulford, and London, which have more than one barracks or camp and their own military headquarters, usually commanded by a Colonel, Brigadier or Major-General, assisted by a Garrison Sergeant Major. In Ireland, Association football (as distinct from Gaelic football) has historically been termed the "garrison game" or the "garrison sport" for its connections with British military serving in Irish cities and towns. In Israel, a "garrison unit" (Hebrew: חיל מצב‎) is a regular unit defending a specified Israeli zone in need of protection from attack from combatants. Israeli garrison units placed in the disputed territories of Judea and Samaria/West Bank are recognized under UN Resolution 242 as occupied pending peaceful recognition by all regional combatants. It was an old custom in ancient Italy to send out colonies for the purpose of securing new conquests. The Romans, having no standing army, used to plant bodies of their own citizens in conquered towns as a kind of garrison. ↑ The Early Islamic Conquests, by Fred Donner. Princeton University Press, 1981; forward from page 251.